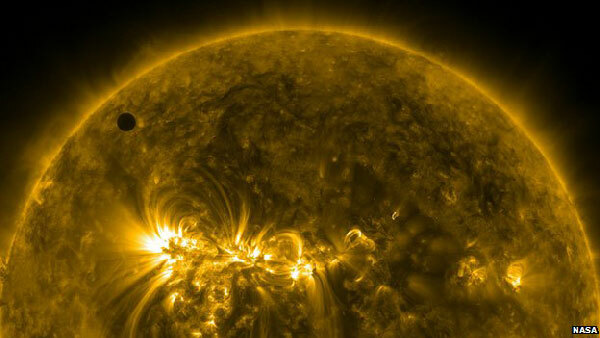 Planet Venus is putting on a show for skywatchers by moving across the face of the Sun as viewed from Earth. The transit is a very rare astronomical event that will not be seen again for another 105 years. Observers in north and central America, and the northern-most parts of South America saw the transit begin just before local sunset. The far northwest of America, the Arctic, the western Pacific, and east Asia will witness the entire passage. The UK and Europe, the Middle East, and eastern African must wait for local sunrise to see the closing stages of the transit. Venus appears as a small black dot moving slowly but surely across the solar disc. Some of the best pictures of the event have been provided by the US space agency's (Nasa) Solar Dynamics Observatory, which studies the Sun from a position 36,000km above the Earth. "We get to see Venus in exquisite detail because of SDO's spatial resolution," said astrophysicist Dr Lika Guhathakurta. "SDO is a very special observatory. It takes images that are about 10 times better than a high-definition TV and those images are acquired at a temporal cadence of every 10 seconds. This is something we've never had before." Many citizens keen to get a view of the transit themselves have been attending special events at universities and observatories where equipment for safe viewing has been set up. 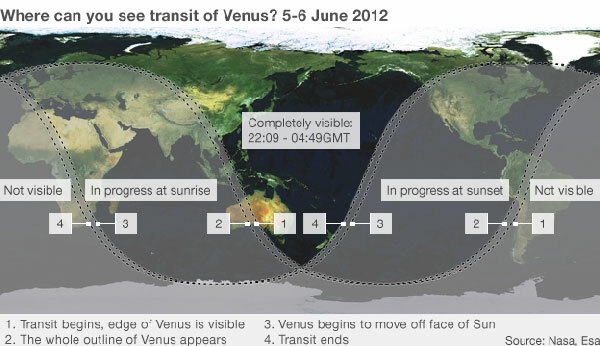 For others, internet streams have provided an easy way to follow Venus's slow trek. Scientists have been observing the transit to test ideas that will help them probe Earth-like planets elsewhere in the galaxy, and to learn more about Venus itself and its complex atmosphere. Venus transits occur four times in approximately 243 years; more precisely, they appear in pairs of events separated by about eight years and these pairs are separated by about 105 or 121 years. The reason for the long intervals lies in the fact that the orbits of Venus and Earth do not lie in the same plane and a transit can only occur if both planets and the Sun are situated exactly on one line. This has happened only seven times in the telescopic age: in 1631, 1639, 1761, 1769, 1874, 1882 and 2004. Once the latest transit has passed, the next pair will not occur until 2117 and 2125. The phenomenon has particular historical significance. The 17th- and 18th-Century transits were used by the astronomers of the day to work out fundamental facts about the Solar System. Employing a method of triangulation (parallax), they were able to calculate the distance between the Earth and the Sun - the so-called astronomical unit (AU) - which we know today to be about 149.6 million km (or 93 million miles). This allowed scientists to get their first real handle on the scale of things beyond Earth. Modern instrumentation now gives us very precise numbers on planetary positions and masses, as well as the distance between the Earth and the Sun. But to the early astronomers, just getting good approximate values represented a huge challenge. This is not to say the 2012 Venus transit will be regarded as just a pretty show with no interest for scientists. Planetary transits have key significance today because they represent one of the best methods for finding worlds orbiting distant stars. Nasa's Kepler telescope, for example, is identifying thousands of candidates by looking for the tell-tale dips in light that accompany a planet moving in front of its host sun. These planets are too far away to ever be visited by spacecraft, but scientists can learn something about them from the way the background star's light is affected as it passes through the planetary atmosphere. And observing a transiting Venus, which has a known atmospheric composition, provides a kind of benchmark to support these far-flung investigations. But Venus itself has come in for scrutiny. Scientists have been using the event to probe the middle layers of the Venusian atmosphere - its mesosphere. They have been looking for a very thin arc of light, called the aureole, which can only be seen when Venus appears to just touch the edge of the Sun's disc at ingress and egress. The brightness and thickness of the aureole depends on the density and temperature of the atmospheric layers above Venus's cloud tops. Observations of the aureole are being combined with data from Europe's Venus Express spacecraft in orbit around the planet to provide information on high-altitude winds. The Venusian atmosphere experiences super-rotation. That is - the whole atmosphere circles the planet in four Earth days, on a body that turns around just once in 243 Earth days.